110928_cornish_int_IMG_1342_02_WEB, a photo by nevardmedia on Flickr. Cornish Interlude (working title) update. Railways enthusiasts generally love books, and I am no exception, needing little excuse to buy another for the collection. They are never idle purchases, they get looked at over and over again to inspire my model making. I think this is why I have far too many ideas, the purchase of a new book inevitably resulting in the back of an envelope sketch for some kind of mini or not so mini layout or simply to help capture that all important atmosphere. You'll note in the bigger version of the above snap a strong Somerset & Dorset Joint Railway bias with many of the books, which as many will know is my favourite line, I'm unsure why, having no real connection with the area other than frequent short breaks in Georgian Bath which was the northern terminus of the line. I imagine it must be the wonderful photography and colour film by Ivo Peters that did it - I'm not alone here. In case you think the latest Cornish project has stalled, quite the contrary, it is underneath all the books which are holding the foam core trackbed firmly in place on top of the plywood base whilst the glue sets in preparation for tracklaying. blog-grab, a photo by nevardmedia on Flickr. Having worked in TV land for many years, I'm used to broadcasters relaunching TV channels at least once a year with a 'bold new look'. There then follows a much promise of a 'better viewing experience' and lots of other 'exciting' reasons for the change - mostly thought up by people that shouldn't really have a job. In the good old days, these clowns would have been bashing tin buckets together, cutting the individual sprocket holes in 16mm film by hand, sticking labels on things (traffic wardens are the only ones that do that these days in the UK, but even they're mostly Polish) or something else useful instead. But of course we don't make anything anymore here in Blighters, so we have to give these people what I call 'non-jobs' which tend to have 'executive' or 'consultant' on the end of their menial position to help them with the chat up lines at office parties and to help console the the fact that they're earning less than they were 5 years ago - "Hello, I'm Wayne and I'm a product locus executive" (tells the shelf stacker where to stand to you and me). To the point of this post, the BLOG; you might have noticed the olde-worlde look in place of the previously slightly garish look. It is very much a case of Emperor's New Clothes, because the content will be just as repetitive and dull as before - in fact, just like much of the the telly I've been involved with for quarter of a century. 110927_cornish-interlude_IMG_1336_WEB, a photo by nevardmedia on Flickr. 3 hours work with glue, hammer, saw, blood, less fingers, and we have a baseboard in a box. This is probably the average time most armchair modellers sit online before lunch pontificating about flanges, why they've lost interest in the hobby, why they don't have enough time to actually do anything, why 66134 has not been released in S gauge, why aren't model railway magazines free and how much Photoshop does that Mr Nevard use on model chuff chuff pics (very little). Actually I don't really dislike armchair modellers, in fact "some of my best friends are armchair modellers", they're just an easy target like people with caravans, lager drinkers, Nissan Micra owners, shell suits and trainspotters with adenoidal voices. In fact, I'd like to see a gallery of these armchairs to see who has the most impressive one. Does anyone have one with a high wing back in red velvet with an ornate gilt frame like on 'Big Bruverrr'? Back to the trainset - The box is not fixed to the baseboard at this stage, that won't happen until after the track has been laid and the bulk of the scenic work done. Actually I might just screw it into place to allow future removal should I want to extend the layout. The backscene will be on flexible plastic and will sit inside, the natural curve of the plastic will ensure no sharp corners. The local printer will print my home-grown photographic backscene onto it. The track will be laid straight onto 5mm foam core (there is a plywood base underneath), it takes glue easily, it might (though I doubt) just sound-deaden a tad, lies flat and it easy to draw on. As long as the surface is waterproofed (primer) before ballasting with diluted PVA there won't be any problem with the card de-laminating away from the foam core having used it successfully with Brewhouse Quay and Catcott Burtle. Any thoughts on a name for this little layout? I like doodling and thinking of ideas for small layouts, small layouts appealing to me because they can cater for all the different type of railways I like. I don't think I could ever commit to just one big project, I'd probably get bored halfway through. 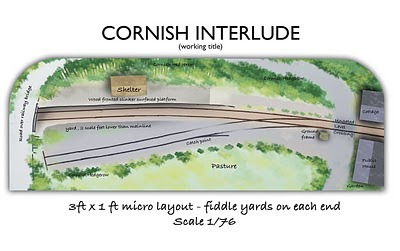 Here we have a back of an envelope plan for a 3x1 foot (excluding fiddle yards) micro depicting a fictitious halt and crossing on the Wenford Bridge branch line. 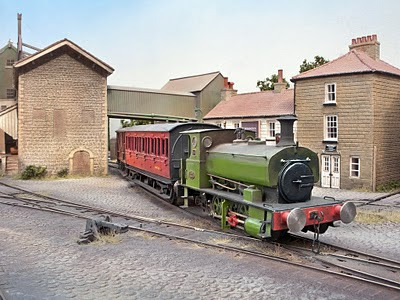 The forthcoming Kernow Model Rail commissioned Beattie Well Tank being the catalyst and now on order! The rear of the layout will be about 3 inches higher than the front which will be a gnat's todger lower than the rail height, the halt being set into the cutting on the far side. High 'Cornish hedges' will add a nice and easily achieved feature. The backscene will be photographic as with Catcott, (see here) this I'll shoot myself, and prepare for the local repro/printing house (I have just penned an article for the popular press on how to do such). I will probably use a flexible 1 foot high plastic base for this which will give me the all important curved corners rather than using 'Bendy MDF' as with Brewhouse Quay. The photographic image will be treated a little in Photoshop (with 'Paint daubs' as with Catcott) to get rid of the pure photographic look, it's important that the modelling takes centre stage rather than the backscene, but it's also important with such a small layout that it feels like it is part of a much bigger landscape. 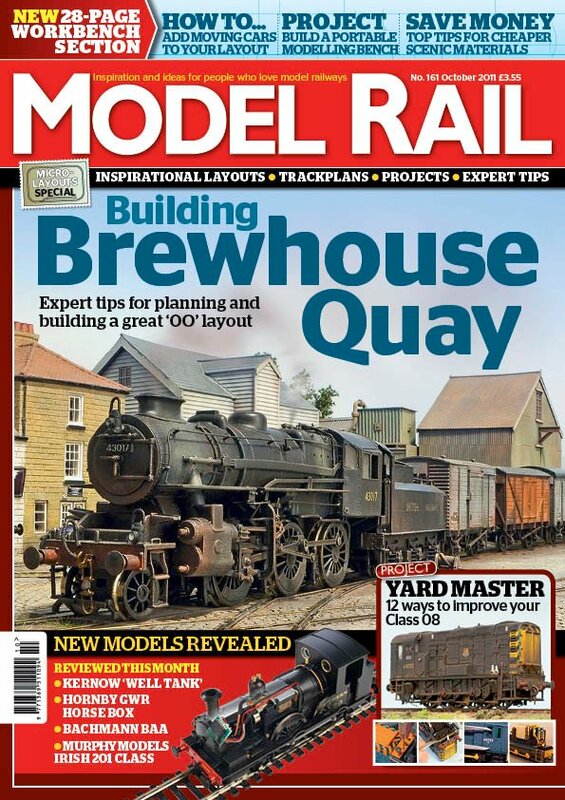 A detailed construction of this layout starts in the May 2012 issue of Model Rail Mag - find out more here. nevard_110920_grain_IMG_1294_WEB, a photo by nevardmedia on Flickr. Currently on the workbench; a Dapol grain wagon. 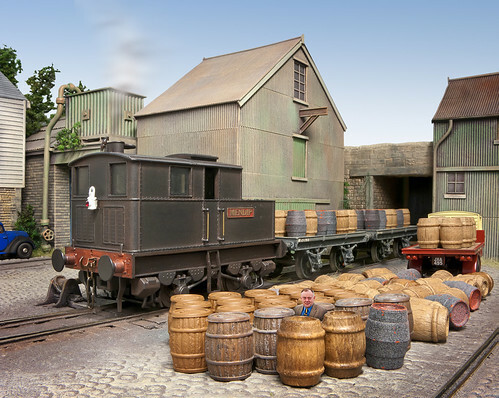 Breweries and maltsters need barley to turn into malt, so at least a couple of grain wagons will not look out of place on Brewhouse Quay and as part of a good train for my other layouts. 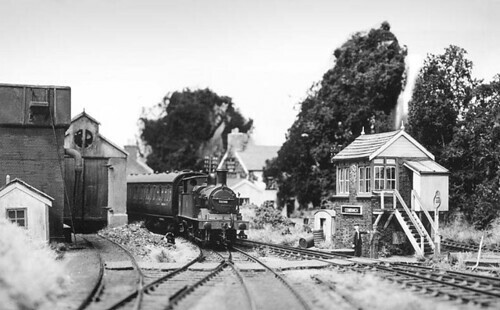 At Model Rail Live last weekend, the fine folk at Kernow Model Rail Centre who had a stand at the show with all sorts of goodies, also had a bargain bucket to suit cheapskates like me who like to pick up models to have a fettle with. In there was the above - perfect! Comparing photographs on Paul's website, this older model has quite a few errors, the main one being that the underframe is completely wrong, especially when it comes to the brakes and associated gubbins. Some brass wire, strip plastic card, the spares box and a little time should be able to address this. The long vertical strips that run from the roof to the chassis do not bend in nearly enough where they join with the chassis, but they will have to stay, trying to rebuild that aspect would be a major headache. There are probably all sort of other faults, but until I complete my adenoidal voice training evening classes I'll have to pass on those for the time being. Despite its failings, this wagon does 'look like' a BR grain wagon, and the mouldings are nice and crisp so it should be possible to create something that 'captures the character' - so will be good enough for what I want it for - given the time I have to put into this project. Paul Bartlett's Wagon Website - book mark this! Yesterday a few of us nutcases met up for a jolly tracking down trains with cameras in the north Oxfordshire/Warwickshire area. Without rambling on too much about what a nice day we had hanging about on station platforms and railway bridges; here are the results. Oh yes, and we also bumped into fellow blogger Phil Parker. You might like to check out what fellow photographers Chris Perkins and Tony Callaghan captured on their cameras too. Chain shunting a wagon at Brewhouse Quay onto the wagon turntable, the turntable then rotates and the wagon is pulled clear. A wagon with more drag would probably produce a better effect - something else to add to the pile of things to be done. In real life shunting like this would be done with rope with chain only on the the very ends, but sadly law of physics give fine thread too much memory to be practical for such a small model. nevard_110918_MRL_DSC_3766_WEB, a photo by nevardmedia on Flickr. 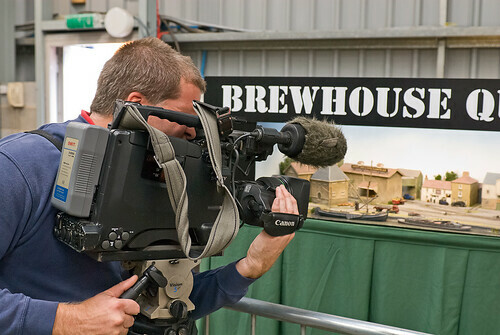 Thank you to all who popped by to say "Hi" at Model Rail Live over the weekend at Barrow Hill Round House whilst exhibiting Brewhouse Quay for it's inaugural outing. I've never been to a show quite like this with indoor and out door exhibits. This made an unusual mix to appeal to fans of all railways whether miniature or full sized. It also made a great day out for families with the addition of train rides and even face painting for the little ones. I was surprised and indeed chuffed to meet for real so many readers of this blog, which now makes me realise that people actually do read it - I must be more careful before commenting on people with beige cars who live in bungalows in future. I also hope after my excessive postings about this little 4x2 foot trainset weren't too much of a disappointment for those who saw it for real. Thank you also to the rest of the Model Rail team right next door who were handed the controller and three link coupling hook from time to time to allow me to escape for the obligatory chips with curry sauce and the all important tea! I have never seen a more terrified look than when I handed the operational tools of 'BQ' over to Chris Leigh and said "you'll be fine!". Thank you to the Barrow Hill posse who made us very welcome, which even extended to an impromptu pub crawl of Chesterfield's bright-night spots, the highlight observing the antics of 'yoof' taking part in a never ending carnival of hen and stag parties from the safety of an Indian restaurant in the town centre. Before I go, yes, the chain capstan/wagon turntable shunting worked a dream after a little practice - Mr Tele-Rail recording the process as proof! Trick? File a couple of tiny notches onto the turntable rails near the perimeter to stop the wagon rolling off! 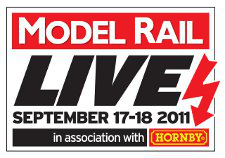 Be sure to check out George Dent's BLOG post on Model Rail Live. nevard_110916_BQ_IMG_1283_WEB, a photo by nevardmedia on Flickr. The first job of the day; a EM76503 Pocketbond "Classix" Jen-Tug artic & flatbed trailer GG2301 in "British Railways" livery 'Mechanical Horse' received a load of sacks, removal of the British Railways badging and a blast of matt varnish. I then popped out to the model shop (Addlestone Models) and bought some fine brass chain for the 'rope' shunting. This evening my spur of the moment kit purchase in the form of a 4 wheeled GWR compo from Ratio took over the garden table in the fading light. This took about 4 hours from opening to box to weathering. Armchair modellers - pah! These 4 wheel ex-GWR carriages according to the blurb on the Ratio instructions mentioned that one or two lasted until the early 1950's in the Welsh Valleys - which was good enough for me, though it's unlikely that any were painted carmine - still, it's rather fetching don't you think? And don't worry about the number, it's total fiction and based on the few numbers I had left on the sheet of Pressfix! The reason why it's here? The brewery needed a runabout for the brewery directors and it was a cheap purchase of course! nevard_110913_BQ_IMG_1214_WEB, a photo by nevardmedia on Flickr. I haven't posted for a day of two due to a dose of seasonal lurgy and the need to catch up with other stuff we all need to from time to time, so basically I have nothing really to write about! I did however grab this snappypoos of 58086 an old Midland 1P 0-4-4 on loan to the Marriott, Dent & Foster Brewery pottering about the wharf yard on Brewhouse Quay. 'BQ' my latest 4ft x 2ft micro takes advantage of the latest crop of ready to plop buildings which form 50% of the structures. I'm very much eating my words, because a year ago I said that I'd never use such! To try to pretend that I'm still a railway modeller all the track and the remaining 50% of the buildings are built from scratch. The loco is my first and to date last full brass loco kit (Craftsman), it dating from 1982. I never could get to run properly, so pro-loco-expert-builder-extraordinaire Phil Hall rebuilt the chassis for me and now after almost 30 years of limping around is now truly stunning runner. 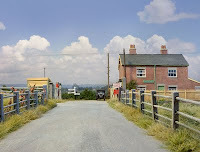 The photo; the sky is not added, it is the actual high curved backscene painted on to 'Bendy MDF' with Halfords white primer and some pale blue fuddy-duddy car colour no doubt popular with people who live in bungalows - the two pigments were misted together gradually getting darker to the top. The photo was shot under the layout's own built in fluorescent lighting with the camera resting directly on top the layout. The puff of smoke is the ONLY addition ('Clouds' filter in Photoshop - thanks to Graham Muz who showed me how) not actually there, and only because I like it. nevard_110909_BQ_IMG_1203_WEB, a photo by nevardmedia on Flickr. Upon my return to the hobby a decade of so ago, a very kind gent sold me around 50 kit-built wagons and half a dozen Maunsell and Bulleid passenger carriages for the price of a round of drinks. As required, I've been slowly refurbishing selected items to bring them a little closer to current standards. 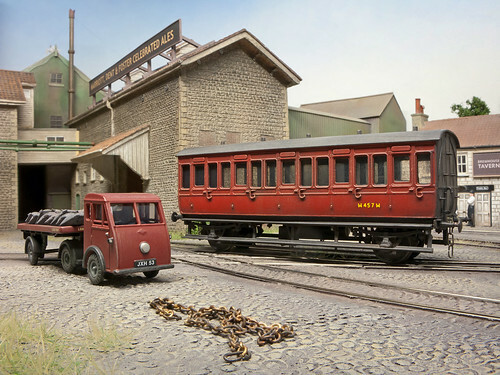 Behind Radstock we have a rake of kit-built tank wagons from Airfix, the rumour being to fire up the new oil fired brewing coppers due to a major investment by Courage, who by 1964 were a major shareholder within the Marriott, Dent & Foster Brewery. Back the wagons, the jury is still out as to whether I'll bother doing anything with these, the weathering is very clumsy by today's standards (dirty thinners weathering being very passe don't you know? ), the ladders are very thick plastic and the tranfers looks like they've been applied to a matt finish due to the haze under them. To be honest, it will be a lot less work to start fresh with some new kits or ready to run, but they serve their purpose for this shot as long as one doesn't look too closely. The little blue Morris (76MES001 Blue Morris 8 E) is a toned down model from Oxford Diecast hopefully draws the eyes away too! Click on the photo above for a bigger view. 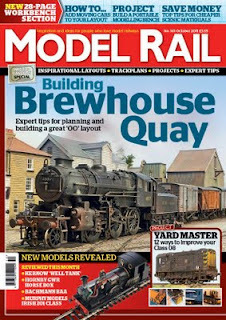 The Making of Brewhouse Quay, the layout used for the background here features in the October 2011 (161) of Model Rail Mag. nevard_110909_scammell_IMG_1178_WEB, a photo by nevardmedia on Flickr. Few of us need an excuse to pick up yet another diecast road vehicle for the price of a pint (though this one is the price of 2 pints because it has more bits than usual). 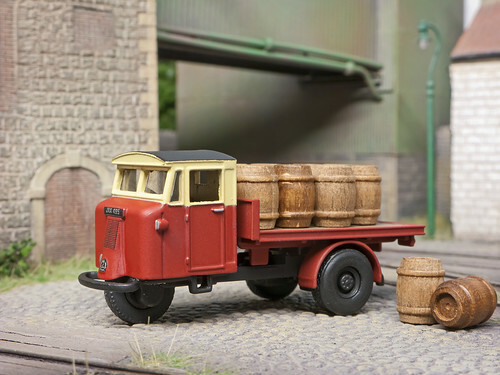 So here we have a Scammell 'Mechanical Horse' aka 'Tri-van' (Oxford Diecast 76MH006 British Rail) sat posing in the cobbled yard at Brewhouse Quay. This one has been de-railwayised with the removal of 'British Railways' and toned down with Testors Dullcote matt varnish. It has also been re-glazed due to difficulty of removing the cast glazing supplied. Usually drilling out the rivet that holds it in place will do the trick, but the clear plastic moulding was rather stubborn. I needed to remove it to avoid having to mask the windows before spraying with Testors Dullcote. In the event I ended up having to break it up, but replacement was simple with a little clear plastic sheet and some Microscale Kristal Klear for the quarter lights. I decided to leave the side windows unglazed because it is always a sunny, hazy, hot day in Brewhouse Quay Land! I hope you'll agree it makes a nice quick and easy embellishment to the brewery yard. The wooden ale casks from Cornwall Model Boats are not fixed for this shot, but I might fix them in place with a little water based PVA to allow removal should it be desired. 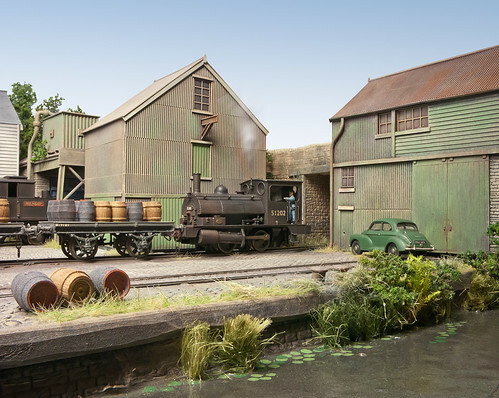 October Model Rail is a ‘micro layout special’, showcasing 4 small layouts with big ideas. 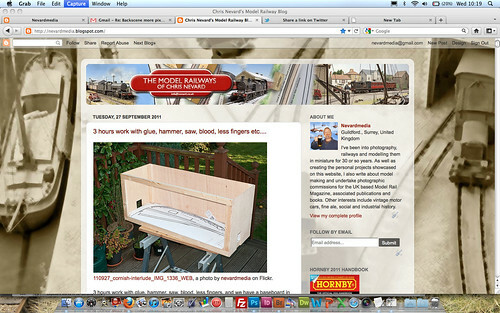 Brewhouse Quay my ‘quickie’ which has featured rather a lot on this blog dominates ‘Workbench’ this month and goes into a little more detail than seen to date. If you’re at a loose end weekend after next on the 17 & 18 of September, pop by and see ‘BQ’ in all its 4ft x 2ft glory at Model Rail Live to have a closer look and ask a few questions. 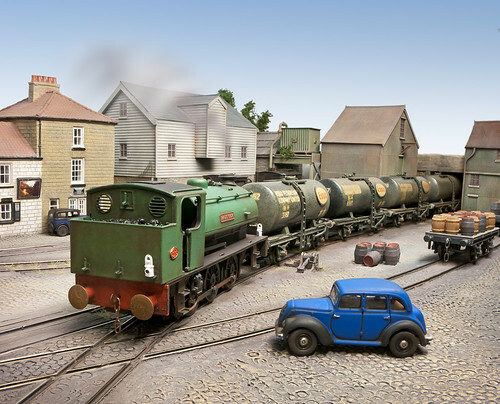 • The Big Picture - showing the rather fabulous Ruddington, coming up next month in Model Rail. This layout is huge and no micro! 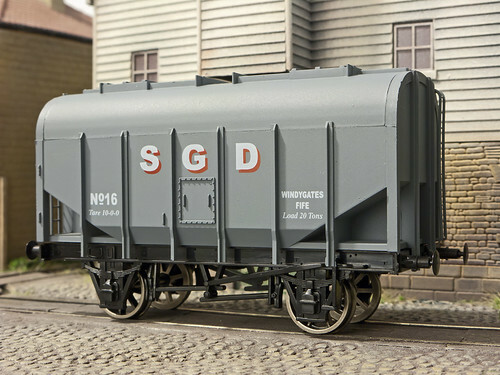 • News: Hattons announce garrett, images of Heljan’s DP2 and Olivia’s Trains EM1 and much more…. • Micro Layout: Ingleton Sidings – Paul Allen’s clever ironing board micro. • Backscene – Chris Leigh always has the last word! nevard_110906_catcottcrossing_DSC_3428_WEB, a photo by nevardmedia on Flickr. 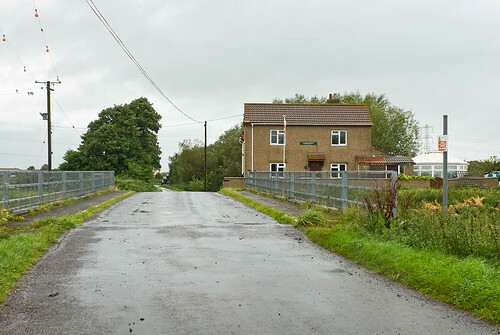 The real Catcott Crossing; since closure of the line in 1966 the cottage has extended and covered in pebble dash. The bridge would appear to have been rebuilt on recent years with new railings. It's hard to imagine that when the railway ran through here there was no running water and it was delivered by rail in a milk churn often carried on the footplate of a passing loco! The model of Catcott Crossing; whilst it was indeed a real level crossing, it never had a halt or sidings, but in my rose tinted parallel universe it did. Find more photos of the layout here. Prevous BLOG posts about Catcott Burtle here. combwich_mrj_07, a photo by nevardmedia on Flickr. I think it's all too easy to be over ambitious, get carried away and take on a project that's far too big and demanding. 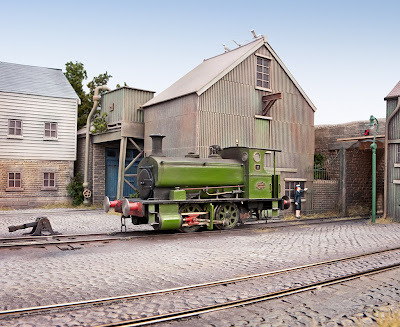 At every show I get a beginner coming up to me wanting to know what I think about building a huge prototype layout - 'Caerphilly in P4' was the latest from a very nice chap who had never even seen a length of Peco. There is nothing wrong with this, but it's not a first layout project project even in OO - well maybe not in isolation or without the help of modellers who have been there done that. Sadly I have a hunch very few of these projects ever happen or even get past the planning stage. Personally I like too many types of railway and could never commit to one big project because I would lose interest, so for this reason I'd rather have smaller projects that will support my my ever-changing whims and still get finished in a reasonable time. When I was younger I had a very puritanical view, but nowadays I'm far more realistic about the time I have available for model making and won't shy from utilizing many of the wonderful ready made bits and bobs we have now. Brewhouse Quay being a good example of this (and I've never had so much fun!). In my case I lost total interest in the hobby for 15 years, but not full sized railways. However rediscovery of a mothballed Combwich in good condition in the old folks' loft got me all excited, and 10 years ago I salvaged it carrying on from where I left off and the layout is enjoying occasional shows now. If I was start over, it is not the sort of layout I'd do again, but I'm really glad I have it now and have no plans to sell or burn it just yet. It would certainly never have happened without the help of my of friends at the Southampton Model Railway Society who showed me that a soldering iron could do more that torture daddy long legs. There are lots of other hobbies out there, we don't have to force our selves if it doesn't work, after all most of us have to do things we don't enjoy, so the last place those things should extend to is 'me time'. Any one for stamp collecting? nevard_110903_BQ_IMG_1087pete_WEB, a photo by nevardmedia on Flickr. nevard_110902_BQ_IMG_1108_WEB, a photo by nevardmedia on Flickr. Looking across the Avon, ex-Lancashire & Yorkshire Railway 'Pug' No. 51202 is spotted shunting the Marriott, Dent & Foster Brewery sidings in Bath. Much care was no doubt needed to avoid the ale casks ending up on the deck. It's is thought that this is an internal shunt between the cooperage and the cask cleaning area. nevard_110831_BQ_IMG_1073_WEB, a photo by nevardmedia on Flickr. Here's a view of Brewhouse Quay which has only been possible for a day or two since the exit to the extra fiddle yard was created. A short telephoto effect makes an interesting slightly compressed view showing off the lightweight track and various ground textures between the rails and around the yard. As soon as one views 90 degrees to the light source, all sorts of interesting things start to happen texture-wise - the lighting here simply being the built in fluorescent tube that runs along the front. 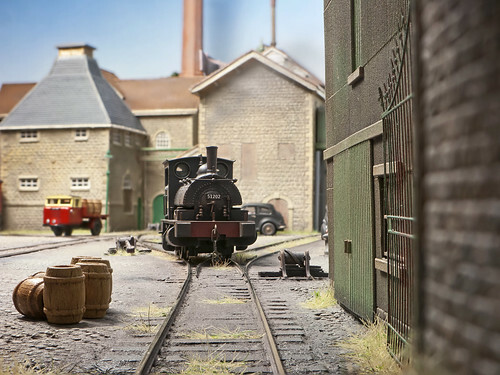 Finding new angles is one of the aspects that interests me most about photographing model railways, and particularly so if it's a layout that has been well photographed for the popular press many times - finding that new angle that's never been captured before gives huge satisfaction. Digressing slightly; I look forward to returning to Pendon at some stage to get some new and exciting angles. The various layouts there have hardly been touched in this respect, especially that the dinkiest of cameras can now give outstanding results that will blow up to double page spread, the small camera size allowing new vistas from all sorts of snug places. 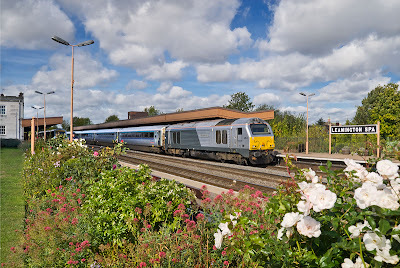 Really digressing - I'd love to shoot an HST in blue and grey blasting across the Vale Scene - it would be a sure hit and introduce a whole new generation to the delights of model railways!